Prime Minister David Cameron has called for Sepp Blatter’s resignation following the arrest of seven FIFA officials, including two vice-presidents, on allegations of corruption. A statement from Number 10 said Cameron was backing Blatter's opposition in the FIFA Presidential election due to take place this week, but conceded that he would be forced to accept the decision if the disgraced head of the organisation remains in power. His remarks come after Secretary of State for Culture, Media and Sport John Whittingdalesaid the arrests were “merely the latest sorry episode” in a series of revelations made about the governing body’s shady deals. He said he “supported the position that urgent and wide ranging reforms are needed,” which include a change of leadership. Answering an urgent question in the House of Commons, Whittingdale said he supported the call to postpone the FIFA leadership election, due to take place this week, and stressed the importance for sponsors to examine their link with the organization. The arrests took place in Zurich on Wednesday where seven top officials were apprehended, with a total of 14 charged by the US as both Swiss and American authorities mount investigations into corruption. 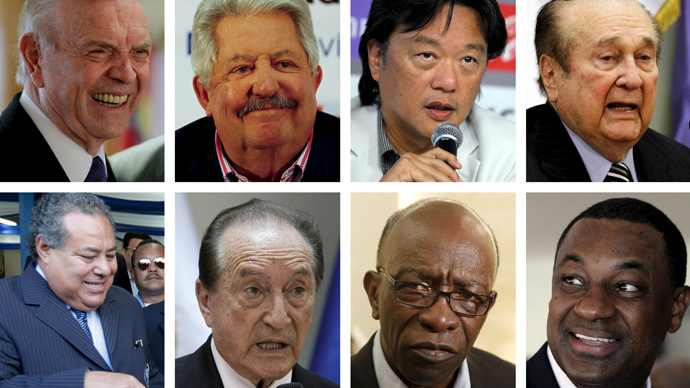 Last year, the Sunday Times revealed FIFA officials had pocketed multi-million dollar kickbacks and bribes to sway international football decisions. Questions were raised in the House of Commons on Wednesday as to whether the UK should begin an investigation into the decision to give the 2018 and 2022 World Cups to Russia and Qatar respectively. Whittingdale told the Commons it is too early at this stage to call a full revote, but said the organization needed to carry out a fully transparent investigation. The UK is thought to have spent £19 million on its failed bid for the tournament, which counted the support of David Beckham and Prince William. Speaking on Thursday morning, former UEFA President Lennart Johansson said he believed Britain should have been awarded the 2018 World Cup instead of Russia. Johansson, who lost out on the FIFA leadership to Blatter, said the allegations of corruption should trigger both an investigation into the decision to award Russia the event and a re-vote for the host country. Russian President Vladimir Putin, however, accused the US of attempting to meddle in FIFA affairs, saying they were trying to take away Russia’s World Cup. The Russia 2018 organizing committee head Alexey Sorokin said he wasn’t concerned by any criminal investigation. He told Sky Sports News: “We have repeatedly stated that we’re not afraid of any investigation. We cooperated with the investigation that was going on for about two years which was headed by Mr (Michael) Garcia. We submitted all the facts, all the papers, we submitted our testimonies – we did everything the process wanted us to do. We don’t know what else we can contribute to that.